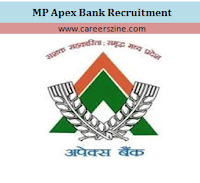 MP Apex bank has recently published an advertisement for recruitment of 1635 clerk and assistant posts. This Job opportunity is best option for those who are graduation pass out and looking for job in banking field. More Details about this recruitment are given below. Age Limit (as on 01/01/2017) : 18 to 35 Years. i.e. a candidate must have been born not earlier than 02.01.1982 and not later than 01.01.1999 (both date inclusive). Age Relaxation as per Govt. Rules. Pay Scale : ₹ 5200 - 20200 with Grade Pay ₹ 1900; Total initial emoluments Approx. ₹ 15900/- per month. Bachelor's degree any discipline with knowledge of Hindi and English typing is essential. One year Computer Diploma Course from any recognized institutions (UGC / DOEACC / Government polytechnic College / Government I.T.I). B.Sc./ B.Com. with Computer as one subject will not be considered as equivalent to the above qualification. A Non-refundable fee of ₹ 800/- for All General / OBC Category Candidates; ₹ 600/- for SC and ST Category Candidates. The Bank Transaction charges for online payment will have to be borne by the candidate. Online Examination : There will be no interview for the post of Banking Clerk/ Computer Operator. Candidates will be selected only on the basis of marks obtained and merit list prepared in the written (main) examination. Candidates fulfilling the eligibility criteria may apply online for above mentioned clerk and assistant . The Online Application posts . Registration open from 01/03/2017. The closing date for online submission of application is 17/03/2017.